We, the Tech Fans, know very well that google surprise us with launching of the developer preview for next Android version Android N or Android 7.0. This is exciting news for all android users but only Nexus users can excite more than any other else. Because all major low-budget smart phones still running on Lollipop and few popular are still stuck with KitKat. And don't know when they will upgraded to marshmallow. Only the cell phone manufacturer company knows when his users will get upgraded version quickly. And for that period of time, Let nexus users feel the proud having that phone. Come to the point, When Android N revealed, Google highlighted giants features of software's. Some of those features which will be more popular in next future are multi window support, revamped notification, quick setting rights from the notification shade, and many more that we don't know about. Some major features have been discovered in first developer preview of Android N such things like ability to double-tap the multi-tasking button to swap between your last used apps. We cannot say that what we found in first developer preview of Android N will be the final consumer version. his preview can give us an idea what Google is planning for future in mobile as next gen technology. Check out the below video to see some hidden features inside of Android 7.0. Note: The videos and images of this information are properties of Technobuffalo.com. We just like this information and feel it is eye catchy for readers that's why we just share it with our way with the help of Technobuffallo.com as well as Engadget.com. Android N runs on lower-end device,because of Google improved memory management Svelte. You can set particular apps to always connect through a specified VPN. You can display your emergency info such as name, blood type, allergies,etc. on the lock screen. A display size option in the accessibility settings lets you tweak the size of fonts and on-screen interface elements. Data Saver(New Features) stops all background data syncing unless you're on WiFi. 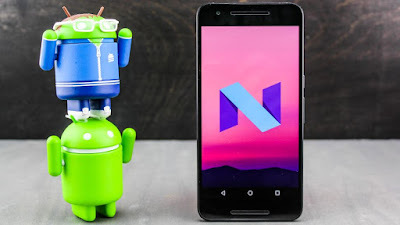 These are the main features of Android N which are discovered by the all tech giants companies and android development companies in the first developer preview. But, we cannot finalized these all features as final consumer version of Android N. It may be more vary in features and it will be more secured than previous version Android 6.0 - Marshmallow.